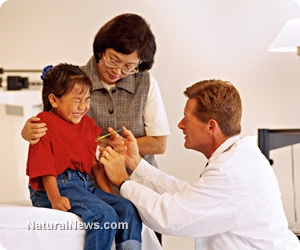 (NaturalNews) It is a common myth perpetuated by both the entrenched system of monopolistic medicine and the mainstream media that unvaccinated children are the social scourge responsible for triggering outbreaks of rare diseases like pertussis (whooping cough), measles and shingles. But the scientific literature suggests otherwise, showing in many cases that vaccinated children are the ones largely responsible for triggering and spreading disease. A recent study published in the journal Proceedings of the Royal Society B: Biological Sciences for instance, found that, despite more than 50 years of population-wide vaccination, cases of whooping cough are on the rise. The culprit? Antigens of Bordetella pertussis that not only are completely ineffective at preventing infection with Bordetella parapertussis, a whooping cough bacterium similar to B. pertussis, but actually promote it by interfering with the body's natural infection clearance protocols. "[W]e show that aP [whooping cough] vaccination impedes host immunity against B. parapertussis-measured as reduced lung inflammatory and neutrophil responses," wrote the authors. "[W]e conclude that aP vaccination interferes with the optimal clearance of B. parapertussis and enhances the performance of this pathogen. Our data raise the possibility that widespread aP vaccination can create hosts more susceptible to B. parapertussis infection." In other words, children who are vaccinated for whooping cough actually suffer from decreased immunity and are more susceptible to B. parapertussis infection than their unvaccinated peers. Vaccinated children, in essence, are the carriers of disease when it comes to all these whooping cough outbreaks, infecting other mostly vaccinated children and putting massive strain on local healthcare resources. Oddly enough, it is the unvaccinated children that remain largely healthy during these outbreaks, as their immune systems are not crippled by exposure to artificial vaccine antigens. This was definitely the case as far as http://www.naturalnews.com, where more than 600 confirmed cases of whooping cough, a 10-fold increase over previous years, was documented. As you may recall, most of those infected with the disease had already been vaccinated for it. More recently, a study funded by the U.S. Food and Drug Administration (FDA) verified that the whooping cough vaccine, which is also contained in the combination DTaP injection, does not even prevent the spread of whooping cough as commonly claimed. On the contrary, the vaccine allowed the disease to fester inside the bodies of test baboons for up to five weeks, debunking a widely believed myth. "[These findings] could explain the increase in pertussis that we're seeing in the U.S.," admitted FDA researcher Tod Merkel, affirming what many are now suggesting about the dangers of the whooping cough vaccine. Should parents who vaccinate their children be held liable for spreading disease? What all this suggests, of course, is that the ongoing demonization of parents who refuse to vaccinate their children is completely misdirected. If it is public health that we are all concerned about in the vaccine debate, then it appears as though parents who choose to vaccinate are the ones about who we all need to be concerned. Perhaps the time is ripe to set the record straight and put blame where it is truly due. The tables have turned, and based on the latest available science, it is now abundantly clear that parents who vaccinate are the ones putting everyone else's children at risk. Will the pro-vaccine lobby, which is all too quick to demand that non-vaccinating parents be held liable for putting others at risk, now be held to the same standard?